Clemson S.C. – The Sonoco Institute of Packaging Design and Graphics at Clemson University is offering courses for industry professionals this fall, covering a wide range of topics in printing and packaging. Courses include an Introduction to Flexography Workshop, Proofing and Visualization Seminar, Paperboard Packaging Seminar, Corrugated Packaging Seminar, Process Color Management Seminar and Flexo Foundations Seminar. Seminars blend classroom learning with hands-on experience in a large group setting, while workshops, limited to nine participants per event, provide more intense hands-on learning in a smaller class size. All courses take place on Clemson University’s campus at the Sonoco Institute’s Harris A. Smith Building. The highlight this fall is a new, two-and-a-half-day Proofing and Visualization Seminar exploring the current state of proofing and prototyping capabilities. Engage with speakers from The Kraft Heinz Company, Creative Edge Software, Esko, Epson, Remote Director, X-Rite, CGS, CSW and others. Gather with other industry professionals and brand owners Sept. 12-13 to discuss the latest advancements in hardware and software technologies available, such as with augmented and virtual reality. Starting off the season is an Introduction to Flexography Workshop, taking place Aug. 13-16. This class is geared toward individuals in need of a fundamental knowledge of the flexographic printing process. Those new to the industry or needing a refresher in flexographic concepts will benefit from this course, including suppliers and manufacturers, sales and customer service representatives, plant managers and supervisors, quality assurance and training staff, and others. Experience a comprehensive, hands-on immersion into either paperboard or corrugated packaging technologies at two seminars this fall: The Paperboard Packaging Seminar Oct. 3-4 or the Corrugated Packaging Seminar Nov. 7-8. Upon completing these programs, attendees will be equipped to make valuable contributions to critical packaging decisions. These courses are hosted at the Sonoco Institute and taught by PKGPRO LLC. At the Process Color Management Seminar Nov. 13-15, gain valuable insights into proven methods that incorporate current trends and processes for CMYK color reproduction. Learn about the workflow of process color printing for flexography, from creative design through press quality process control. Finally, Dec. 5-6, experience a comprehensive exploration into the flexographic printing industry. This course is suitable for anyone involved the industry, including sales, customer service, administration, marketing staff and others. 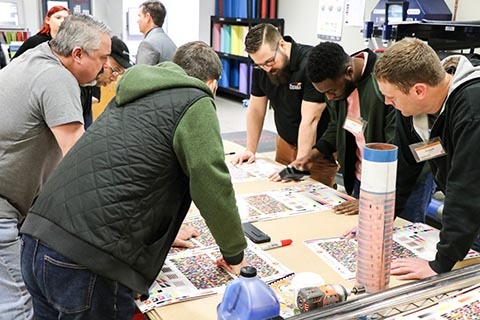 Gather together to learn about an overview of the market, the printing process itself, substrate and ink options, color and design considerations, and much more. At the end of this course, take the test to receive your FTA FIRST Individual Certification – Level I Certificate of Completion. The Sonoco Institute offers a discounted rate for early bird registration ending roughly a month-and-a-half from each course start date. Groups of three or more people can also receive a similar rate when registering together. Visit SonocoInstitute.com/courses for further details or to register.